(T/F) Gunsmoke: One Man's Justice finished in the week's top ten rated television programs. False ... it finished #37 of 86 shows in the week's Nielson's. An estimeated 10,833,000 households watched. The number one show that week was the Winter Olympics Games. Gunsmoke: One Man's Justice was the first Gunsmoke to have a record player. The movie Gunsmoke: One Man's Justice first aired on CBS February 10, 1994. One day later, William Conrad, who played Matt Dillon on the radio, died. 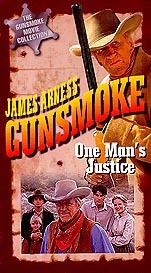 James Arness directed Gunsmoke: One Man's Justice. In Gunsmoke: One Man's Justice, Ken Curtis makes his first appearance in a Gunsmoke movie. In Gunsmoke: One Man's Justice, Dillon owns a ranch. True. Its name is The Dillon Ranch and had its own brand. It also had a wind mill. Dillon prayed (out loud) in the movie Gunsmoke: One Man's Justice. Dillon framed his old Marshall's badge. Arness died his gray hair in Gunsmoke: One Man's Justice. One of the following was not featured in a closeup in the movie Gunsmoke: One Man's Justice? Answer: ... James Arness' neck. In fact, a scarf hid Arness' neck, probably to hide his age. Makeup has difficulty covering an aged neck. In Gunsmoke: One Man's Justice, we first learn that Dillon's father was a Texas Ranger. True. Dillon's father was shot in the back. The man who did it was caught by the Rangers, tried and hung. Later, Dillon became a deputy. The Lone Ranger was also a Texas Ranger.